Technology has provided us with endless ways to entertain ourselves, but relying on computers, smartphones, and tablets can take a big toll on the health of our children. With childhood obesity on the rise, it’s time to look for other ways to keep our kids occupied – especially if these toys and games get our kids active. There are hundreds of amazing outdoor toys on the market that kids and teens will be delighted to have. Speak with your kids about what they’re interested in, and pick a few toys that suit their tastes. Even if your kids are on the younger side, picking up a few budget playthings for them to tinker with can still get them moving without breaking the bank. 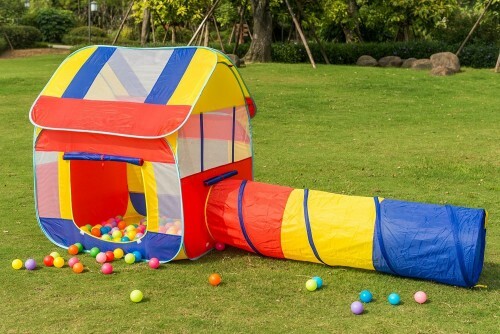 Let’s get started….best outdoor toddler toys and toys for kids. Pick price category below. There’s no need to spend a ton of money on outdoor toys when your children are very young. They’re still developing their interests and learning their favorite methods of active play. Getting a few inexpensive outdoor toys will allow them to experiment with the games they like. Save the big stuff for when they’re old enough to know exactly what it is they want to play with. If your child isn’t old enough to join little league, they can still practice hitting those home runs. 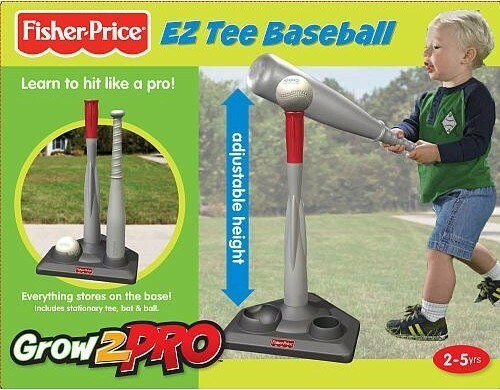 The tee makes it easy for kids to set themselves up. If they aren’t yet coordinated to hit a pitch as it’s coming at them, they can still practice their swing by whacking the ball off of the post. 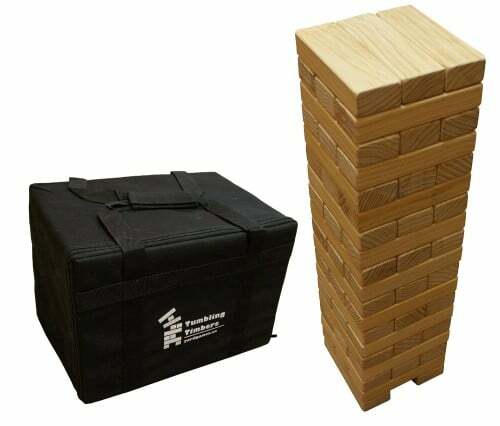 The post adjusts in height, so the set will grow with your child. Ring toss is fun for kids of all ages. It helps build coordination skills, which are just as valuable to toddlers as to athletic teens. The difficulty can be adjusted by simply moving further away from the pegs. As your kids build their skill, they can play from longer distances. 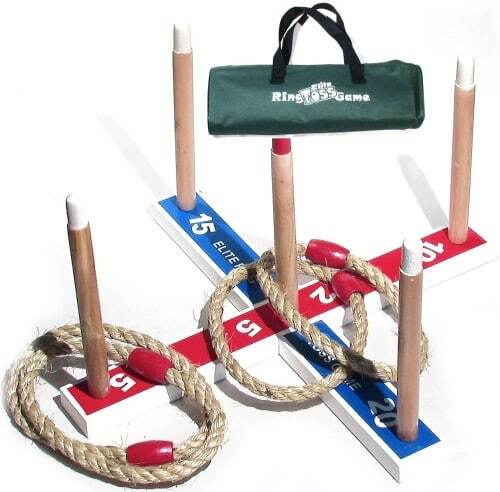 This set comes with both rope and plastic rings, so you have the option of playing with heavier rope rings that are easy to control, or lighter plastic rings that make the game more challenging. Signing your child up for a soccer team can be expensive, and you may not feel inclined to spend all of that money if you aren’t sure your child will maintain an active interest in the sport. 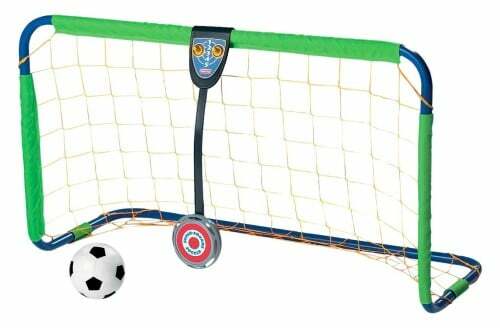 This soccer goal is adjustable in height, and comes equipped with a target. If the child kicks the ball into a center of the net, it plays a sound. Field practice has never been easier or more affordable. Even college kids love a spirited match of disc golf, but the game is safe and easy enough for even the smallest youngsters to play. This set comes with six colored Frisbees, so the whole family can play together. The objective of the game is to fling your disc and make it into a basket goal. This builds stronger motor skills, and sends kids sprinting off into the yard to chase runaway Frisbees. Bowling is a beloved sport. Unless you take your kids bowling on the weekends, they probably have a motion compatible video game that simulates some of the basic athleticism needed to bowl. 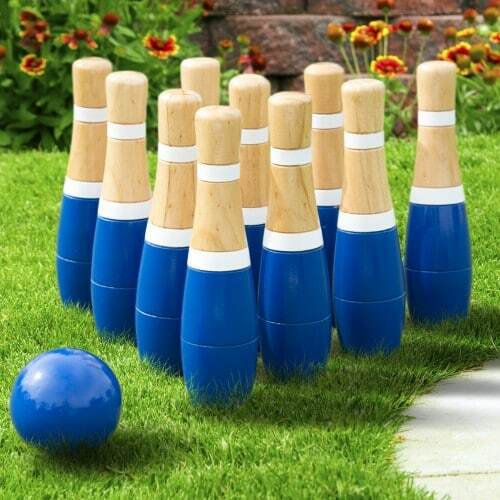 With a durable wooden lawn bowling set, your kids will genuinely get active. They’ll need to set the pins and retrieve their own bowling balls. That extra movement makes all the difference in keeping children in motion. Playing dice is a fun way to pass the time, but dice games are usually limited to a tabletop. All players remain seated, and it doesn’t involve a lot of movement. 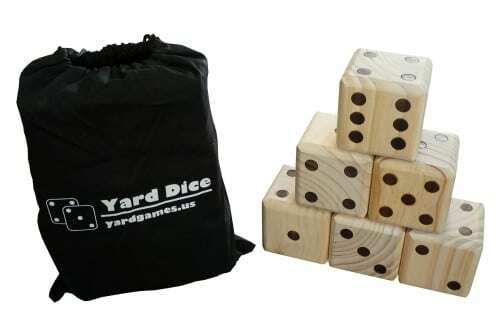 With yard dice, the whole lawn in your table. These dice are large and easy to find, and constructed out of durable wood. This classic entertainment staple has been modified to suit a healthier lifestyle. Basketball players are known for being very tall, and school age children are known for being short. A full size basketball hoop is unnecessary for young children, but this doesn’t mean they should be deprived of their ability to enjoy the sport. 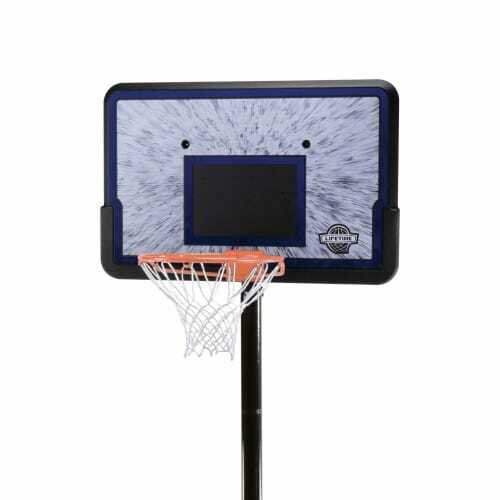 With a smaller scale basketball hoop, even the youngest children can learn to dribble and dunk. This particular basketball hoop adjusts from 30 to 48 inches. As your children grow, you can raise the hoop to reflect their height. Whether you’re dealing with tots or teens, you’ll find that people of all ages love hockey. Equipment and fees associated with getting your kids signed up for an ice hockey league can come out to a staggeringly high total. 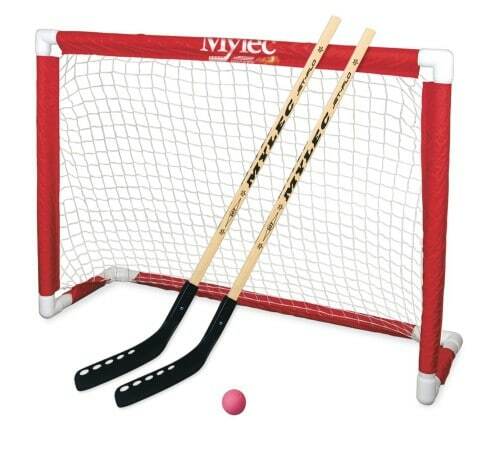 Purchasing hockey equipment that they can use in your driveway is far more economical. It’s even safer, as there’s no slippery ice or sharp skates involved. Set up the net near your garage goal, and allow your kids to make shots from the bottom of the driveway. Buying a wet slide allows you to duplicate the fun of a waterpark in your own back yard. 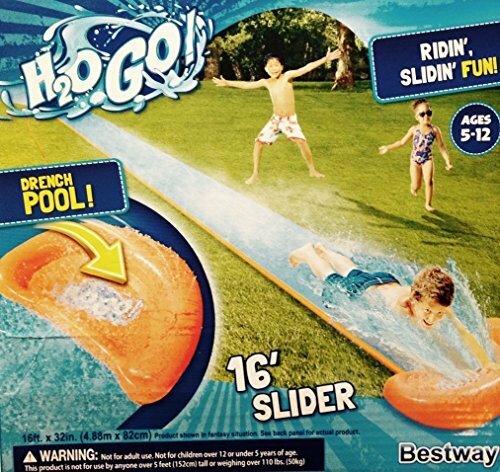 Simply hook your garden hose up to the front of the slide, and watch as the jets spray water all over the slippery surface. At the end, there’s a small splash pool that’s cushioned for a safe landing. All you need is an open space that’s free from debris and a little running water to make a big splash in outdoor entertainment. 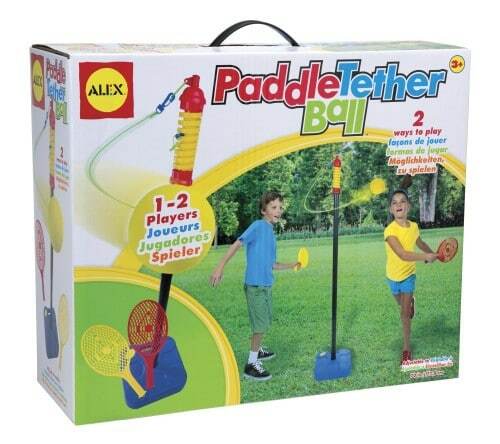 Tether ball is an especially fun activity for two players. Think of it like ping pong, but a little more fast paced. Kids will test their top speeds chasing the ball and paddling it back to their opponent. It tests reflexes, and causes players to think on their feet. 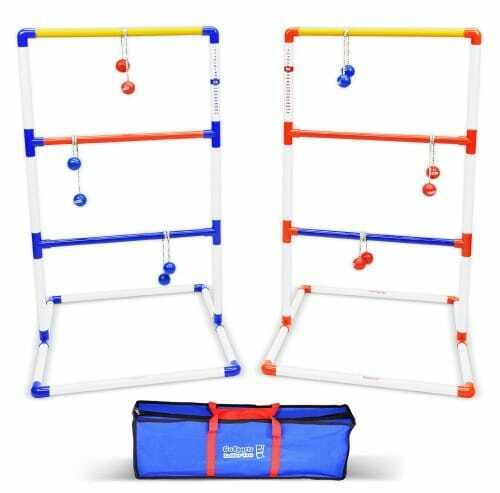 Unlike serious tether ball games which include metal components, this one is constructed of softer materials and plastic for a safer way to play. The soft ball on the end minimizes the risk of injury, and the flexible plastic rackets pass the ball gently. If your kids are a little older and play on the rough side, it may be more worthwhile to invest in some mid-range outdoor gifts. These are the kind of outdoor toys and games designed to stand up to wear and tear. Many of them require slightly more complex skills to use. If you have a group of rowdy kids (or one rowdy child who enjoys inviting friends over to play), getting a durable basketball hoop is almost a necessity. This particular hoop adjusts to over ten feet in height, making it perfect for both middle school and high school kids. This hoop is weather resistant, so you can leave it up all year. It’s also portable and set on wheels, so it can be easily moved to shaded areas for kids who want to play outside on hot days. If your kids have ever purchased the plastic tabletop version of this game, you know that the pieces get everywhere. Frequently, the tiny plastic disks will get lost under furniture for weeks. With the giant version meant to be used outside, you’ll never have to worry about losing another piece. Your children will be walking around the board, determining how to strategize against each other. Why not join in on the fun and play with them? If you don’t have a lot of shade in your back yard, it may be difficult to coax children into playing outside during the warmer months. By providing them with a shady little hideaway, you’re making it easier to beat the heat. This pop up tent anchors into the ground, so you’ll never have to worry about the wind blowing it away. Fill the main tent with plastic balls to add a little more fun to the experience. You don’t need to be at the beach to make sandcastles. 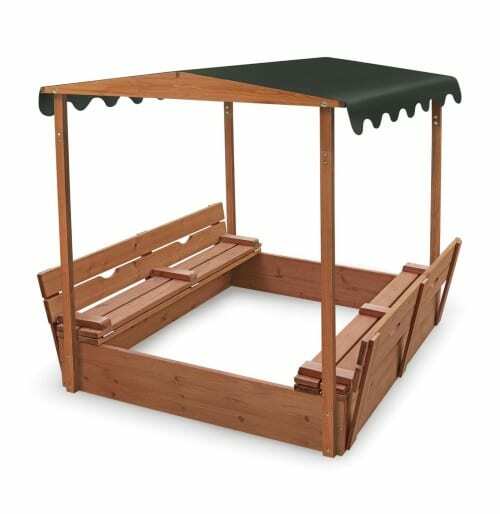 This deluxe sandbox comes with a canopy to keep your kids protected from the sun, as well as two bench seats that convert to a full cover when not in use. This sandbox is easy to maintain and easy to keep clean. Since it’s bottomless, you can fill it with as much or as little sand as you like without having to make special considerations for drainage. Pick up an assortment of sandcastle toys, and allow your kids’ imaginations to run wild. Jungle gyms are generally only seen on big playgrounds, and most parents may not know that they can actually purchase one for their own home. This climbing toy is made of specially coated steel, designed to withstand all weather conditions and erosion from the sun. It’s a modest size, but it’s perfect for children between the ages of 2 and 10. If your child likes to climb on the furniture, give them something fun to do outside that’s aligned with their interests. This stackable tower strategy came starts out at 2.5 feet tall, but can get as high as five feet without falling over. Players take turns removing a sliding brick from the large, vertical puzzle. The goal is to keep the tower from collapsing as the boards are removed and added to the top. You may remember the smaller version of this game designed to set up on a coffee table, but this yard sized version encourages players to move around and bend their bodies as they make their moves. Pogo sticks can be challenging to use, but once your child has mastered the art, they’ll fall in love with the big, rewarding bounces. This pogo stick is designed for children ages 9 and up, since it takes some physical strength to use. Kids build balance attempting to stand on the stick, jump, and land back down again. 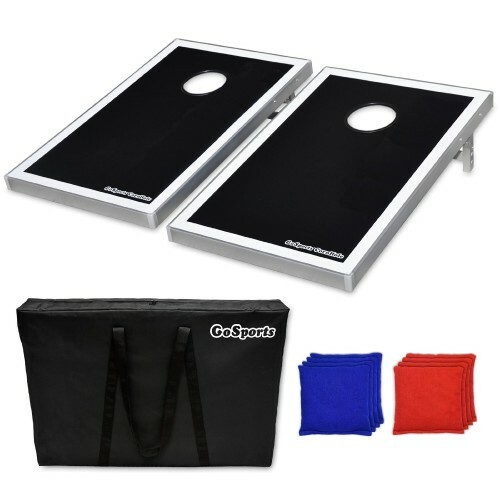 The foot features a non-slip grip, making it easier for first-time users to learn to jump. 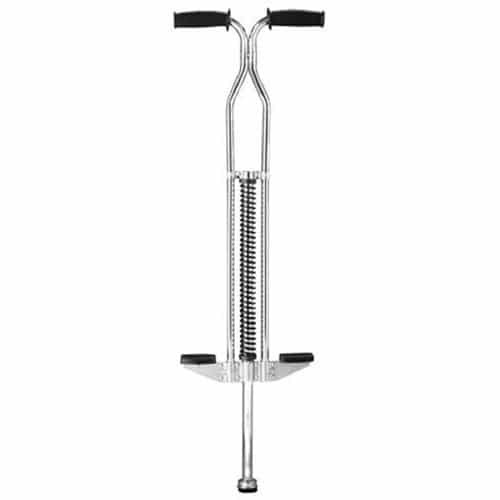 Lightweight steel construction makes this pogo stick durable, allowing it to take a few tumbles without compromising its integrity. 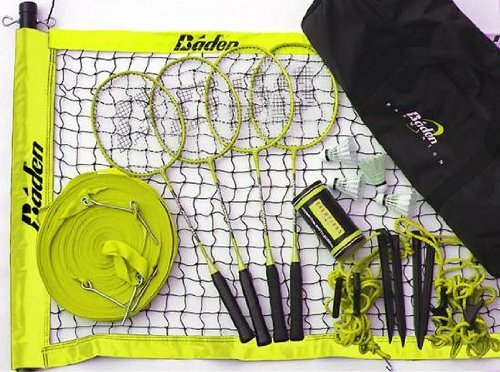 Badminton is more than a great time – it’s also a great workout. This set allows for up to four players, with tournament style rackets, a regulation net, four shuttlecocks, and all of the equipment needed for assembly. Players run back and forth with their rackets, trying to catch the shuttlecock. There’s nothing like fast, darting movements to really get the blood flowing. Your children will learn to be quick, having to develop sharp reflexes in order to master the game. 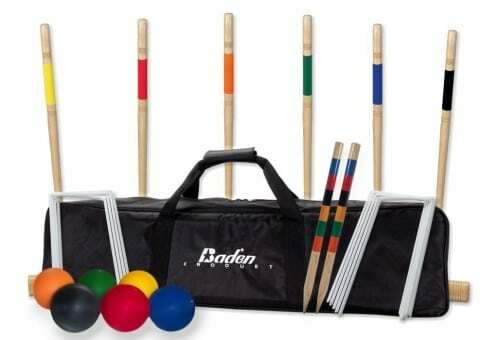 The game of croquet is similar to the game of golf, except multiple players can all enjoy it at the same time. This set allows for up to six players per game. It’s easy to set up, with 9 steel wickets that can easily be moved from place to place. No croquet game ever needs to be the same twice. This is a casual outdoor activity that involves a little bit of walking and a lot of strategy, and it will become a quick favorite among brainy kids. This game can be played alone, with one opponent, or in small teams. Players can practice alone, or compete with others. The goal is to get your bean bags through a small opening on the board across from you. Each person takes turns tossing, and after all the bags are out, players need to run to the other side to retrieve them. This particular set is durable, portable, and comes with reinforced bean bags that are less likely to come apart with regular use. Horseshoes is a beloved American game, and it doesn’t actually involve horses. Farmers used to play the game with real horseshoes, but since its inception, replicas have been made specifically for the sport. Horseshoes is a tossing game, where each player needs to toss weighted horseshoes onto a stake, utilizing the open spot to catch the metal pole. 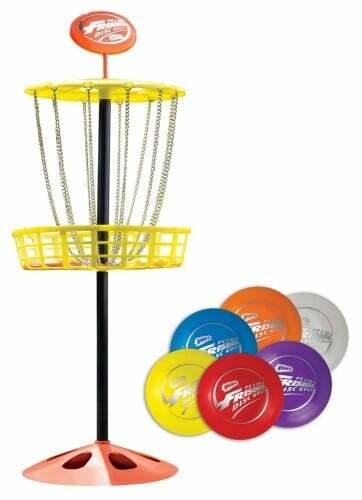 This kit comes with horseshoes made of drop-forged steel and long tips, making the toss easier to control. Bocce is an underappreciated outdoor game that involves tossing a larger ball, called the bocce ball, close to a marker ball, called a pallino. It’s almost like a combination of billiards, golf, and croquet, except the ball is thrown by hand. Players will be running around in the grass, trying to make calculated throws that land more precisely than the throws of their opponents. 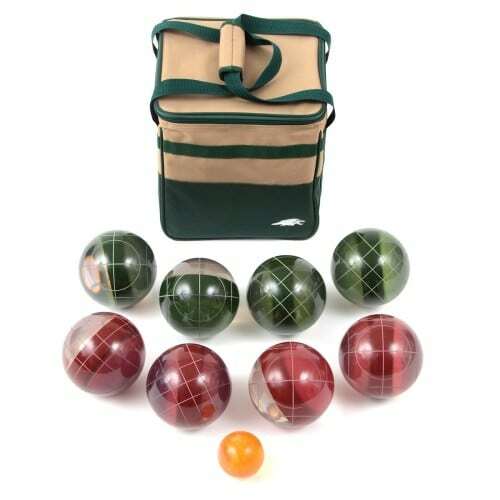 This is a regulation style set that comes with weighted, resin bocce balls and a weatherproof carrying case. This game is beloved among college kids, but most children ages 10 and up will be able to enjoy it. When you were a child, did you ever tie your shoelaces together and try to toss your shoes over a powerline? Ladder ball is the same concept. The balls, similar to golf balls, are held together with a string. Competitors need to toss the balls, making them land on the rungs of the ladder. Different points are awarded for different levels, and even how high or low the balls land. This kit is constructed of lightweight PVC, making it easy to assemble and transport. Play it in your back yard, or bring it to the park with you. 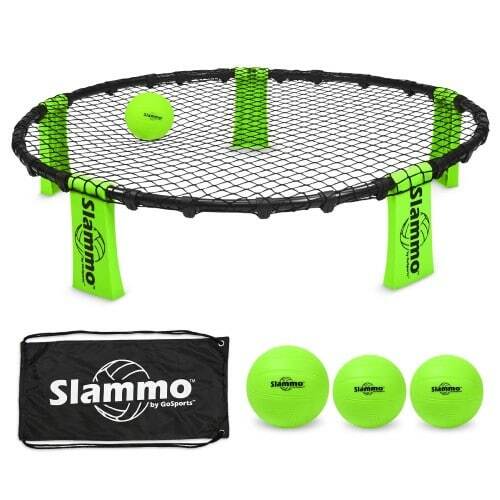 Slammo is similar to volleyball, but it involves a lot more movement. Rather than spiking the ball over the net, you spike the ball into a bouncing net that sends it towards your opponent. Your opponent needs to slam it back to you before it hits the ground. This involves a 360 degree radius of motion, making for more active play. It folds compactly into a carrying case, so you can take it with you anywhere. Try bringing it to the beach for a little summer fun. Brainiac kids often prefer to play inside, where they can best tend to their intellectual pursuits. That’s why this set is a life saver for kids who prefer to play with their minds, rather than their bodies. This is a giant chess set for your back yard. 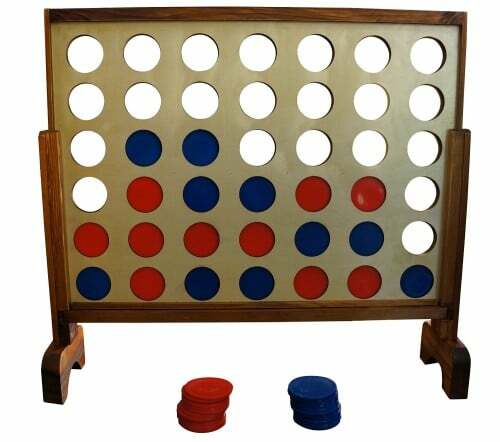 It’s too large to play while seated, so players will need to stand up in order to inspect the board and make their moves. The board itself is UV proof, waterproof vinyl and the pieces are made of a dense polymer plastic. Play outdoors all year round. If you’re looking to purchase a gift for a special occasion, it may be worth shelling out more money to make a big impact. If you’re purchasing a joint gift for multiple children, it’s sometimes more economical to buy a large item for everyone to share. 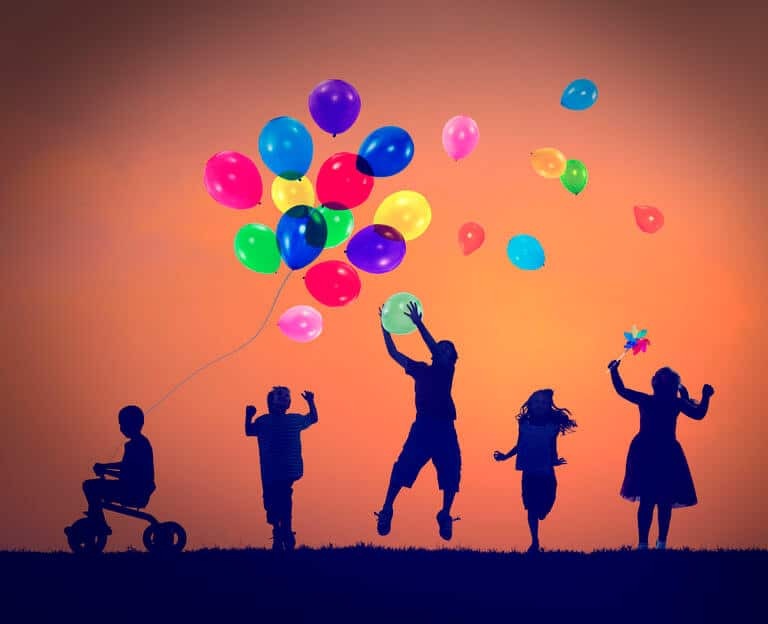 If your children are difficult to motivate, thinking outside of the box with some especially exciting toys and activities can coax even the most stubborn children to spend some more time outside. With a bounce house, your kids will be getting exercise without even realizing it. This is a bounce house that it’s virtually impossible for your children to get bored of. 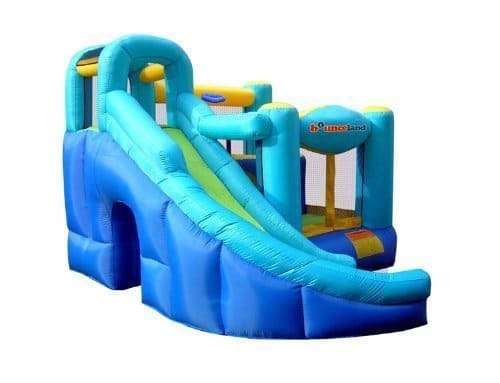 Crawling tunnels and a giant slide will provide your children with hours of entertainment. At its inflated size, this bounce house is 12 feet by 10 feet, and 8 feet tall. It’s safe to use with soft accessories, such as plastic balls. 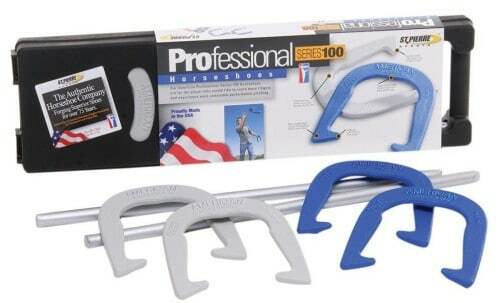 It’s constructed from the most durable materials on the market, marking it nearly puncture proof. It even comes with a powerful blower to keep it inflated, and all the materials you’ll need to install it. Since it inflates in less than a minute, it’s easy to take down and put up when it’s not in use. Store it away in the winter, and bring it back out for the rest of the year. Owning a trampoline is every kid’s dream. Being able to invite their friends over after school to play on the trampoline is not only great for developing social skills, but also athletic skills. 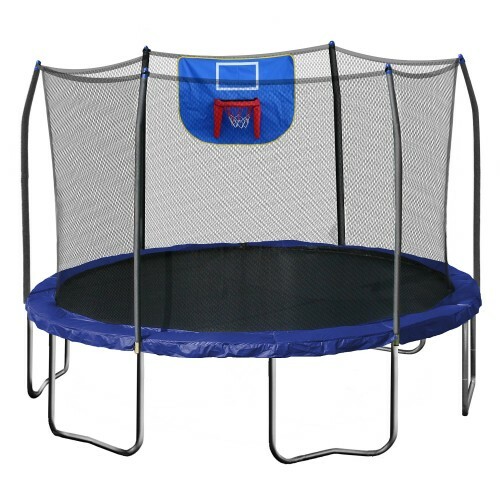 At a 15 foot diameter, this trampoline is large enough to accommodate two or three youngsters. They’ll be able to jump and perform cool trampoline stunts, and even enjoy the basketball hoop that comes built into the enclosure. This trampoline is designed with safety in mind. A reinforced net keeps children from tumbling to the ground, and the gapless frame system and extra sturdy spring protection pad prevents children from slipping through. The frame and all of the materials are coated for additional UV durability, so this trampoline can safely stay erected all year. In ground pools are very expensive to have constructed, making above ground pools a much more practical solution for families. They’re easy to set up, fill up in a few hours, and simple to maintain. This particular pool comes with a PVC frame that’s easy to snap together, and a durable liner to prevent erosion. It comes with a pump and filtration system, keeping the water clean and safe for your children. 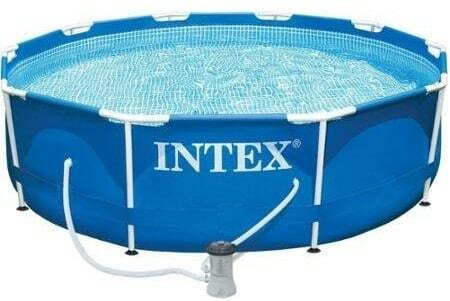 A 10 foot diameter gives kids plenty of room to swim around, and a 30 inch depth makes it safe for young swimmers. This is a great pool for children to learn in with a little adult supervision, and it’s large enough for you to be able to accompany your kids in the pool. There’s enough space for fun floating toys, and the pool can easily be covered with a standard tarp to keep it free from falling leaves or curious insects. Bring the fun of the neighborhood park into your own back yard. This swing set can accommodate up to 10 children at the park, making the perfect source of outdoor entertainment for children. It will even stand up to large events, such as a child’s birthday party. The steel powder coated frame is strong and rust resistant, and all of the play equipment is padded by a sturdy, safe plastic. 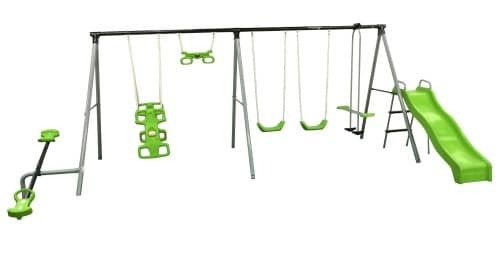 This swing set comes with a slide, two single swings, one dual swing, a rocking swing, a pull up bar, and a seesaw. All of its features are entertaining and gentle, giving your kids a safe way to play. Every element of the design has been considered with your child’s safety in mind, down to the vinyl coated swing chains to prevent finger pinching. Children love imaginary play. They like to discover their interests and social structures by looking at the world through the eyes of an adult. Though you shouldn’t buy your children their own house for a number of reasons, buying them a playhouse is an excellent way to let their imaginations run wild. 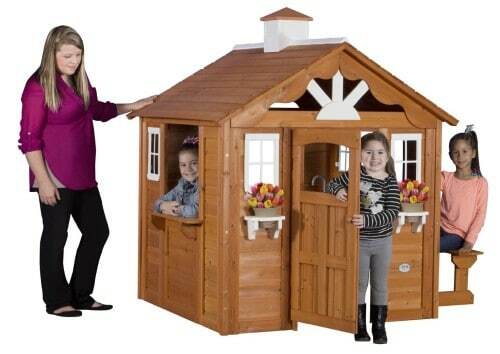 This is a cottage style playhouse with a few toy appliances inside. Small benches and counter spaces even provide your children with a place to eat lunch. This cedar wood construction is top of the line for play equipment, guaranteeing that it will stand up to years of use. It also provides shade on hot summer days, making it safer for smaller youngsters to play outside while the sun is beaming. This is more comprehensive than your standard swing set. Rather than being constructed out of metal tubing, this unit is made of real wood. 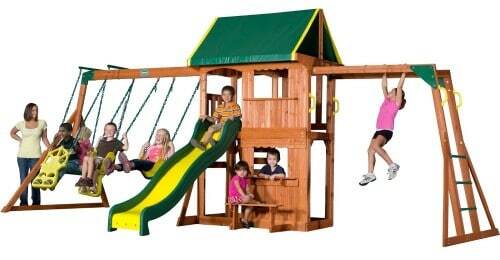 It offers monkey bars, a play house, a bench, a slide, two single swings, and one double swing. It’s a comprehensive outdoor entertainment center that features everything your children might need, including a covered area where they can escape the sun. If you’ve ever seen a beautiful wooden playground, this is a compact version of one that’s sized to fit in your back yard. If your children have a lot of friends, everyone will be able to enjoy this unit together. It even comes with the framework for a sandbox on the lower level. Since it allows for customization, this discovery toy will grow with your kids. 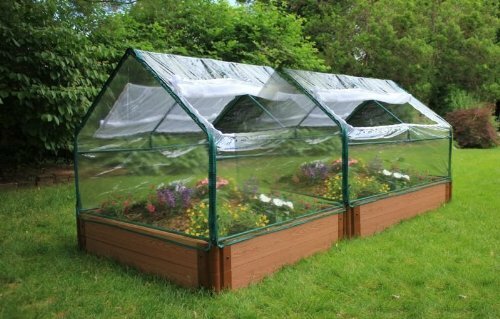 Why buy your children a garden set with a greenhouse? The answer is simple – gardening is excellent exercise, and children are often awestruck by watching their own food grow. All children could use some more fruits, vegetables, and exercise. This garden bed will provide everything they need to make that happen. Since they’ll be excited to watch their garden grow every day, you won’t have to beg them to go water the plants. This bed has a greenhouse covering to keep pests and harsh weather conditions from affecting the plants. The raised bed design makes it easier to fertilize the plants while allowing for better drainage. It will be easy for kids to plant their favorite healthy snacks and watch them grow. It’s education, exercise, and nutrition all wrapped into one family friendly activity. If your kids are little climbers, imagine how much enjoyment they’d get out of their own rock climbing wall. This playset it meant for adventurous youngsters to scale safely, no carabiners or ropes required. 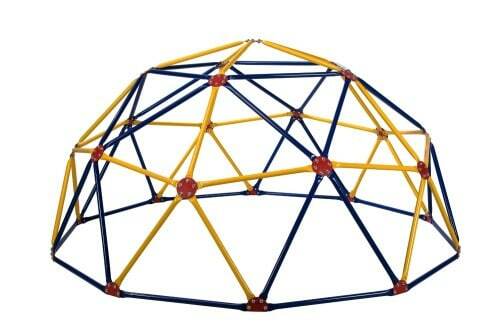 It’s shaped like a pyramid, and features four unique climbing surfaces, including cargo nets and a floor net. 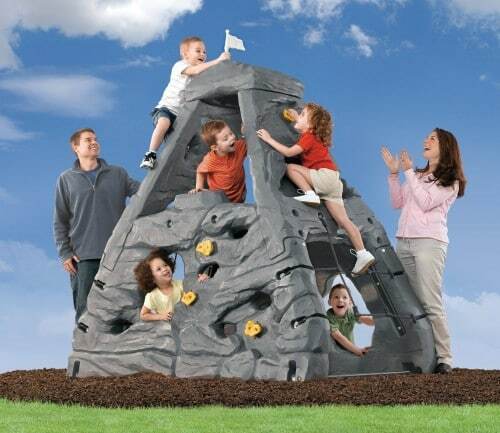 Up to 4 children can climb the summit at one time. Since this unit is made of a durable weatherproof plastic, it’s much safer than wooden or metal climbing alternatives. Short climbing distances make tumbles easier to contend with, and virtually painless if the climber is surrounded by a safety material such as rubber mulch. If your children are too small to make the most of a full sized swing set or large play set, you may feel as though you are out of options. Thanks to the clubhouse climber, you now have a save alternative for your toddlers or preschool aged kids. This is a large set made from safety plastic. 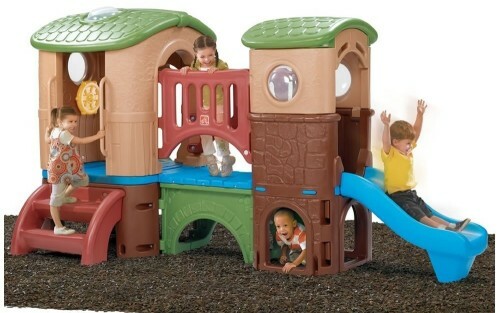 It features extra railing, safety steps, and hand grips to help tiny bodies navigate its wonders. With turning wheels, crawling and climbing spaces, a giant slide, and a small observatory, children can explore and interact with their environment safely. Since the unit is low to the ground, you won’t have to worry about small tikes falling off. If you live near a lake or pond, you’re going to love water bouncers. 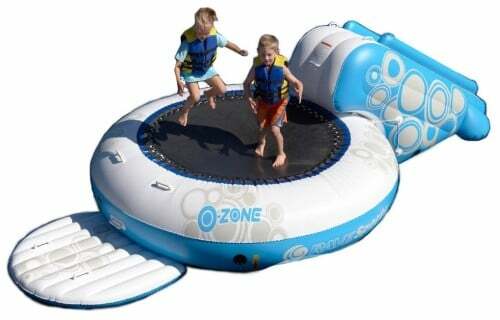 This particular bouncer combines all the benefits of a floating raft, a waterslide, and a trampoline into one fun toy. It’s equipped with handles that help children climb back onto the raft after they’ve jumped off or used the slide. Just inflate the platform, and drop it into the lake. It can be safely tethered to a dock to keep children from floating away in larger lakes. The thick PVC material is puncture resistant and designed to hold up well against UV rays. Bring it on your next family camping or boating trip.